Regardless of whether you are delivering training material through a seminar, eLearning system, webinar or mobile learning, getting your staff fully engaged in the learning process remains a challenge. Here are 6 ways to get higher engagement from course participants. 1. Gather feedback before you start. Consult with employees, formally or informally, and find out what they feel they need to learn. What you are considering as important may not match what they are urgently seeking. Is there a demand for a certain new skill or a refreshment on a process? Do they want to aid to their collection of soft skills like team-building, leadership development and personal growth? 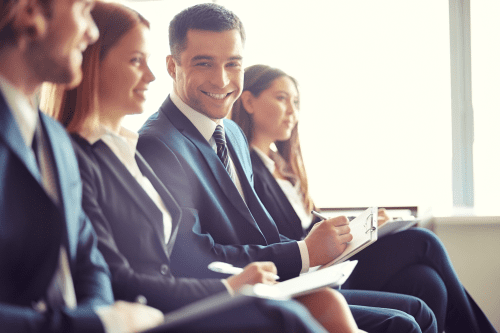 If there is a subject your management team feels need to be the focus of a training program, talk to your employees and gain insight on what they need to know most about this topic. This will be useful in devising your curriculum and the way you are going to teach the subject matter. 2. Give the employees who will be participating in the new training some advance work to do before the course starts. It may be as simple as encouraging them to consider what they personally want to take away from the course. Or you may ask them to bring forward for the first day of the training period one example of something they really want to know about the subject at hand. This has two benefits. First, it ensures that you have the material to cover the key points that are important to the employees. Second, it solidifies in their mind what they want out of the training, and when they are able to accomplish that, they will have a great sense of accomplishment. 3. With every training session, wait about one week and then ask for feedback on how the employee is able to use the material they learned at the session. This is helpful in determining memory retention in future programs and figuring out what worked and what didn’t. 4. Try to deliver the material customized to the employee’s personal learning style. Some may learn by doing, so you offer hands-on training. Some may learn by reading, so create an excellent workshop for each program you are offering. Some may learn in a classroom setting, some from mentors and some from taking eLearning courses from the comfort of their homes. A huge part of successful training is figuring out how your employees learn. Try to offer more than one style if you have the resources, to ensure that you meet different learning styles. 5. Schedule a period of reflection the day after any training program is delivered. It doesn’t have to be long, just a 15 minute meeting with participants will do. Ask what they remember most from their training, and from what they learned, how can they see an application for it in their workplace today. Ask them as well if they did anything differently today than they did yesterday, before they had their training. 6. Ensure that you use the notes you collect in follow-up conversations (informal or formal). Use these notes to determine what was the most effective in training, and what appeared to have little impact. Try to get specifics, such as one process that changed because of their training, or one attitude that changed. Your goal is to ensure that whatever training is provided leads to immediate implementation within the workplace.